You can expect to have a GP or Nurse Practitioner consultation within 2 working days if your condition is non-urgent, however you may have to wait longer if you are requesting a particular GP. 1. You can book directly with our physiotherapist if you have a problem with your joints, are experiencing muscular pain, sprain or back pain etc. 3. All of the pharmacies in Stanley and the surrounding areas operate a Minor Ailments Scheme and can offer advice and treatment free of charge, even if you do not normally pay a prescription charge. A full list of conditions can be found on Page 10 of our practice leaflet. 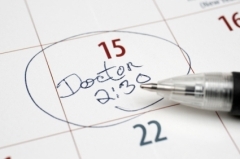 Urgent cases will always be seen on the day, by either the GP or Nurse Practitioner, therefore you will be asked to leave details with the receptionist, including telephone number, and the GP or Nurse Practitioner will ring you back to assess the urgency, avoiding any delay.